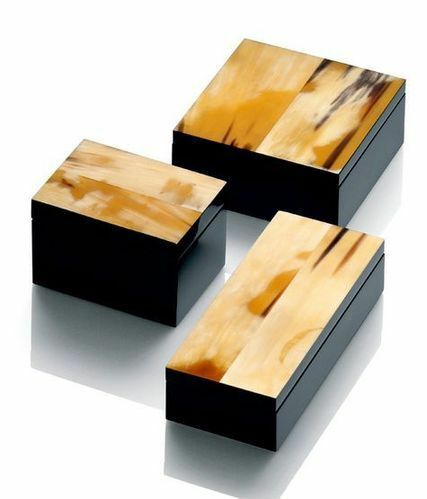 We are engaged in offering premium quality Horn Jewellery Box. This box is designed by our adroit professionals using premium quality basic material and the latest technology. Offered box is checked against various quality parameters under the strict supervision of quality controllers to ensure flawlessness. In addition to this, the offered jewellery box is available in various sizes, designs and can also be customized as per various specifications of our prestigious clients. Established in the year 1995, at Delhi (India), we, “Essar Fasteners”, are known as the leading manufacturer, trader, exporter and supplier of an exquisite collection ofButtons & Handicraft Products including Designer Button, Metal Button, Toggle for Clothing, Photo Frame, Jewellery Box, Drink Coaster, etc.These are available in a variety of designs, patterns and colors & can be customized as per the demands of clients. Owing to features such as fine finish, durability, high quality, compact design and easy to clean, these products are extensively appreciated by our clients that are spread all around the globe. Products offered by us are manufactured using the best grade raw material and latest designing techniques in complete compliance with the set universal norms. Clients can avail the offered range from us at the most affordable rates.